The anonymous Quixote essay was previewed by several informed individuals, all of whom knew the author's true identity. One such individual is Dr. Cyril Wecht, who is perhaps the most renowned forensic pathologist in the world. This morning I received an email from him allowing me to post his succinct review. "Your “Sorrowful Knight” article is outstanding. A marvelous satire of forensic scientific/medical investigation." --Cyril H. Wecht, M.D., J.D. Note that Cyril simply commented on the style of Mantik's article without expressing an opinion on the Harper fragment. I suspect this is because he has no firm opinion. I know that when I spoke at his 2013 conference in opposition to Mantik I received nothing but support and encouragement from Wecht and his family. While I had asked if I could speak at the conference, it was their idea that I speak in opposition to Mantik. If you want this thread to serve any purpose beyond insulting your fellow forum members, Greg, you should quit with the games and identify the primary author of the article. I feel certain it was Mantik himself. But if he doesn't want to be identified with the article, we should know, and know why. I'd hate for him to be held responsible for the article's many mistakes if it was in fact written by someone else. Why the refusal to address the many, many RED items within the article irrespective of the authorship? The identity of the author is not nearly as important as what was written. To claim otherwise is a fallacy. Additionally, that you have not even attempted to address the items in Dr. Chesser's addendum is almost beyond belief. Also, Cyril used specific words, such as, outstanding and marvelous in his very complimentary review. Those are very straightforward adjectives. He also used another specific word, namely: satire. PANZA: I believe the fragments going down through the neck broke off a piece of bone and this bone fragment exited the throat. CERVANTES: Have you actually demonstrated this anatomically, i.e., how does this fragment pass through the skull, and then pass through an entire vertebral body, in order to exit at the midline of the throat? And why is there no evidence of bone fragments or bullet fragments on the neck X-rays? Moreover, how do you explain the bruise at the top of the lung? It is really not kosher to simply state a conclusion such as this (especially not such an extraordinary one) without a shred of supporting evidence. Greg is absolutely correct here. Many have theorized that a bullet or bone fragment exiting the throat caused the wound, but have not to my knowledge ever explained how this trajectory could be followed. Thanks to the BuLab Memo we know there was "no bullet metal" present on the slits in the front of the shirt, so no bullet or fragment did this. P/F: Based upon your observations of the wounds, was it more likely that the damage was caused by a missile or something like a small bone fragment? PERRY: Well, I think it's more likely to be a missile than a bone fragment. The only reason I say that is that secondary missiles, which is what a bone fragment would be, generally don't attain the velocities that produce this sort of thing. It's a long way from the skull to the trachea, and still retain adequate momentum to tear 1/4 to 1/3 of the trachea's circumference (cartilage is tough), then exit through 7(?) layers of skin (which requires a minimum velocity of 300 fps per several forensic investigation books), and two layers of shirt...AND remarkably enough not leaving any mark on the back of the necktie. The oft-mentioned "nick" is on the left side of the top of the necktie. Not the back, and not even the side. There is a good deal of evidence supporting the hypothesis that fragments going down through the neck broke off a piece of bone and this bone fragment exited the throat. 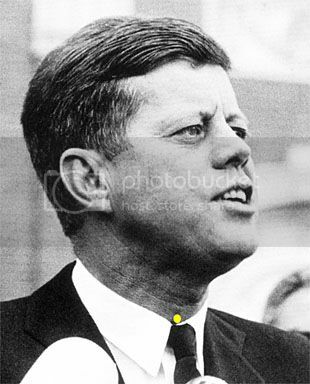 The throat wound was located directly behind the knot of Kennedy's tie. Only Jackie Kennedy, Diana Bowron, Margaret Henchliffe and C. James Carrico had the opportunity to see the throat wound with JFK's shirt buttoned, and tie in place. Jackie Kennedy says she turned and looked at JFK and he had a quizzical look on his face. She continued to look at his face until the head shot. At that point, he fell/was pulled down with his head in her lap. The wound was to the right of the midline and at most only slightly above his collar. From her position to his left, even if she had been looking, would she have seen it with his left arm in the way? Nurse Diana Bowron was the first medical person on the scene. In her WC testimony she is asked what she FIRST SAW regarding JFK's wounds. She states the head wound only. Specter's questions continue to refer to what she first saw, and that is how she answers. In multiple interviews with Harrison Livingstone she says her first observations were from the right side (she brought the emergency cart) and with all the SS in the way she had no access to JFK. She then went around to the left side of the limo, and examined JFK. She turned his head to take his pulse at the carotid and only then saw the throat wound. In the Livingstone interview, she explains that she was very nervous at her WC interview. She was a 22 year old foreigner with 3 months in the US and finds herself dealing with a presidential assassination, and testifying in a government murder hearing. She states that "It was one hell of an introduction to America." Following Bowron's examination of JFK, Jackie still refused to let go of him until Clint Hill offerred his suit coat which Jackie wrapped around JFK's head. 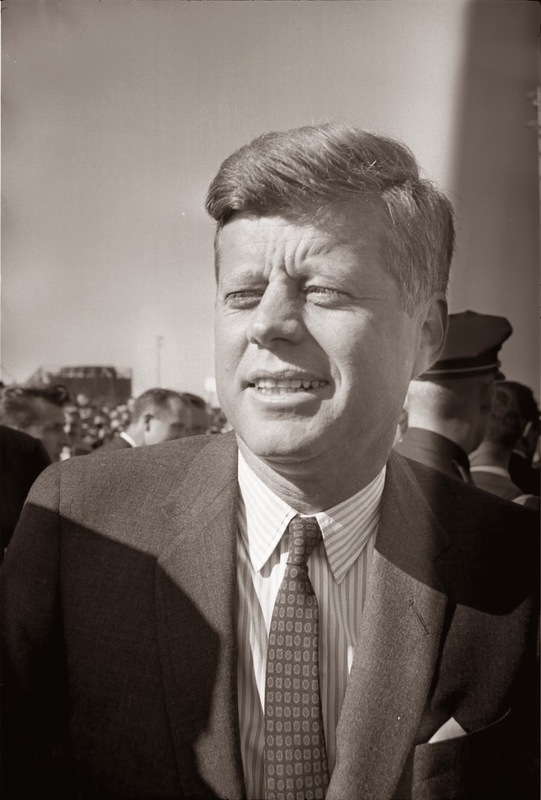 As described by witnesses to the ER entry, the coat remained covering JFK from just below his eyes down to his chest, until it was removed for Carrico to begin his exam. Margaret Henchliffe definitely got a good look at the wound before the tracheostomy was performed. She was never asked if she saw the wound before or after clothing removal. A transcript of an interview by Wallace Milam exists, but despite a continued effort I have been unable to obtain this. It may reveal the wound's location relative to the collar. Carrico states in several different interviews that the wound was just above the collar. In a video interview he points to the location on his own throat. The lower edge of his finger is touching the top edge of the collar. Carrico states his first desire was to examine JFK's chest and he never looked at JFK's throat until HE HIMSELF unbuttoned the shirt - he did NOT see the wound with the collar buttoned. However, he did see the wound position relative to the unbuttoned collar which adds a lot of weight to his testimony. Only Diana Bowron saw JFK's throat with the collar buttoned, and she is clear that the throat wound was above the collar. Carrico, as he has stated, did not look at JFK's throat (he had no idea a wound existed there until he saw it himself) until he had unbuttoned the collar. But he is still a strong witness. Henchliffe is still an unknown. Who else had the opportunity in addition to those I have mentioned? I'm well acquainted with Ashton's GIF. [sEE PREVIOUS MESSAGE] The WC wanted this wound as low as possible to connect it to the much lower back wound. Are there any questions regarding the authenticity of the Autopsy photos? IF the throat wound is in THAT location, how did an exiting or entering missile do NO damage to the tie? IF the wound is behind the knot on the necktie then the front shirt slits are BELOW the wound. How did a missile create them? Of the three people who could have seen the wound before the shirt and tie were removed, two have located the wound above the collar, and we don't know where the third person places the wound. None of the three people who could have see it have placed it below the collar. I don't think this behind the knot location is unquestionable. Neither do I. But I feel it has the greatest support. By far. Some really nice work Tom. Do you mean popular support, or is supported by testimony and evidence? Tell me how a missile could enter or exit that wound location without damaging the tie. If you can't do that, then the missile entry/exit could only be above the collar. Regarding the tie v. wound, it seems very straight forward to me. BAXTER: "Out tracheotomy incision was made in the 2nd tracheal ring which was immediately above the area of damage." Baxter and Perry performed the trach with Robert McClelland holding the retractor. Perry never states exactly where the wound or incision were located, but surely Baxter who was Board Certified and Assistant Professor of Surgery at that time is as good a witness as Perry. This location is supported by 3 other doctors present who have stated the wound was located between the 2nd and 3rd ring. My height and weight match JFK quite closely. My neighbor and good friend of 25 years who has been a Board Certified ENT and Plastic Surgeon for 30 years has confirmed the location of my 3rd Tracheal ring for me. Depending upon WHICH dress shirt I wear (I have NO PROBLEM relocating the 3rd ring myself) the 3rd ring is either just above, right at, or just below my collar line at a point slightly to the right of the midline. In some photos, JFK's tie appears to be just below his Larynx, and in others quite a bit lower. It is important to remember that the midline of the shirt collar is lower than the sides. IMO, an above the collar wound location is reasonable. Not trying to change the subject but here is what I mentioned above. I didn't realize that this was from your own website. David Mantik, Cyril Wecht, and Pat Speer all put JFK's back wound at T1 in spite of definitive physical evidence of a wound at T3. The rank incompetence is staggering. Who cares what hacks think? I found this 11-22-1963 Ft. Worth photo to add the location of the entry wound. Much to my surprise, someone had already added a yellow dot precisely where I was going to put it. Taking the distance from my Addam's Apple to the 3rd tracheal ring, and applying this to JFK's Adam's Apple this is the same location on him. Whoever added the yellow dot came up with the same location that I did. Coincidence? I am not saying this is 100% accurate, but I do think it is evidence that an above the collar wound location is reasonable. In addition, if the point of a forum is to agree - or disagree - on various discussions, then I want to post here that I completely disagree with the bullet/bone fragment theory that caused the hole in his throat. So I'm reposting this here from another thread. You may wonder why it starts out the way it does below but it's because as much as we want to believe we have all of the answers, none of us do. I was responding to the other thread's reply to my own. And keep in mind that I say this as a 100% conspiracy believer so I'm not pulling a John McAdams here (and I've never earned a dime for being a serious student of this case for 41 years). Anyway, my short video below explains my theory of a throat shot back shot and in addition to it, the bullet that hit his back did not go deep enough according to the autopsy. Further, that muscle and tissue and clothing in that back area is, combined, very thick. There's no way that a bullet fragment or piece of bone (did any bone even break off?) would have torn off and created a clean looking hole in the throat. As soon as it would have hit, it would have slowed down considerably. I'd like to give credit to the person who made the GIF with JFK wearing a suit and no suit. Nice job. But I think it can be misleading. The reason is because JFK is laying down on the autopsy table and your neck does stretch when doing that. I'm not saying that laying down will suddenly move a wound way up; however, I think it can be misleading to just cut out a suit and put it on a person's body and say a shot in the throat can't be done. Look at this photo of him here in more or less the same position he was sitting in the car and you'll see there is some wiggle room down by the throat area where a pro shooter could easily put a shot right above the tie. You can take photos, cut them out, and make animated GIFs and then call them "facts." I can do the same as seen in the short video I made. Neither of us were there so no matter how "factual" we think our work is, it's still supposition. If you don't see what I see in the Z film, or don't *want* to see what I see, then there's nothing I can do about it. To each their own. Question - who in the hell is the FBI to tell a person who was 30 feet away from the event, and who was in an excellent vantage point, that "...it couldn't have happened that way?" Mr. DULLES - I am a little confused, I thought Dr. Carrico was absent. That was an earlier period. Dr. PERRY - No, sir; he was present. Mr. DULLES - He was present? These people on the WC and their lawyers had no business conducting interviews about the medical portion of the case. All they were there for is to get as much as they could out of the witnesses, cajoling and interrupting and prepping before they appeared, so it all dovetailed to the preconceived conclusions they were ordered to achieve. I put great stock in Perry's press conference quotes as seen in the video. They were fresh - right after the event - and with no fudging, whitewashing, or staring him down saying, "It didn't happen that way." And they came from a person who'd witnessed dozens of gunshot wounds as a medical doctor. I notice in your post here you use flippant remarks about other people's opinions. Stuff like "whiff" and "you'll whiff." And things like spending "hundreds of hours of their lives" trying to figure things out about the case. Whether right or wrong - or a little bit of both - all of us here are passionate about the case (aren't you?) Nobody's trying to win a prize here for best, most arrogant and 100% perfect post on this forum. It's a place to share ideas, thoughts, and theories. And after all, no matter how right we think we are, we'll never get it 100% right. There is an excellent oral history that Carrico made in August 1997. In that history he describes the sequence of events regarding John Connally's and JFK's entrance into Parkland. The importance about these movements is that Diane Bowran had already begun to remove JFK's clothes by the time Carrico entered Trauma room 1. Are you certain that Diana Bowron began to remove JFK's clothes BEFORE James Carrico entered TR-1? In the video you mention, my memory is that Carrico "unbuttoned" JFK and opened his shirt *himself*, in order to listen to his chest. Following this exam he states that Diana Bowron THEN removed his clothing. Carrico does state that he did NOT look at JFK's throat (he had no idea a wound was present) until AFTER the shirt was unbuttoned, so he did observe the wound location relative to the shirt collar, but NOT with it buttoned. In any case, Carrico was the FIRST MD to attend to JFK. That has been confirmed by both nurses, and Perry, Baxter, et al who arrived after he was already at work on JFK. He arrived in TR-1 closely behind JFK. Margaret Henchliffe was the only person in the TR when JFK was wheeled in and she confirmed that Carrico was right behind him. Carrico is asked about the throat wound and does indeed suggest it was above the collar line however he goes on to explain that by that time much of JFK's clothes had already been removed and it was not possible to be positive. I would agree with your above statement except for the word "suggest." Carrico states in this interview as he did in his WC and HSCA testimony (he was not interviewd by the ARRB) that the wound was ABOVE the collar line. He does much more than suggest. In this 1997 interview he adds the caveat that he did not look at JFK's neck until he began to remove JFK's clothing. Still he DID see the wound with unbuttoned collar, giving him the 2nd best opinion as to its location. Diana Bowron who took JFK's pulse at his carotid artery after "turning his head" observed the throat wound while he was still in the limo with tie in place per her Livingstone interview. She was only asked by Specter what she "First saw" regarding wounds. She made it quite clear that she only saw the head wound at first. Because she couldn't get to JFK from the right side of the limo, she moved to the left and intered the limo. Even then she did not see the throat wound until she turned his head to take his pulse. Only four people COULD have seen the throat with the shirt buttoned and tie in place. Jackie and Carrico did not look at his throat. Bowron did look and states that she saw the wound while in the limo. Margaret Henchliffe saw the wound prior to the trach, but is never asked if she saw it before of after clothing was removed. Although Carrico does not mention this in the '97 interview, Bowron states that she "assisted" Henchliffe in removing the clothing. The only one who claims the wound was below the collar was Roy Kellerman. Kellerman came into the TR with the body. Clint Hill's coat was wrapped around JFK's head all the way from the limo. In his own words, he states that when the nurses and doctors moved in, he moved away from the table. Henchliffe was already in the TR, and Bowron preceded Kellerman into the TR, and in the words of all, Carrico entered right behind JFK's body. Kellerman did NOT remove Hill's coat from JFK's face and chest. He stepped back immediately to get out of the way. In his WC testimony he claimed he ABSOLUTELY saw JFK on the table with collar buttoned and tie in place, therefore the wound was below the collar. Did he make this observation through Hill's coat, or through the nurses and doctors crowded around JFK? It's not absolutely impossible that he saw what he says he saw, but it is HIGHLY unlikely. Additionally, the official explanation is that the bullet from the lower back wound exited from the throat. The WC did everything possible to move the back wound up, and the throat wound down. Would Kellerman admit the wound was above the collar? Remember, he's the guy who heard JFK's unmistakable voice AFTER he was shot. He also sat there and did nothing while his president was murdured.